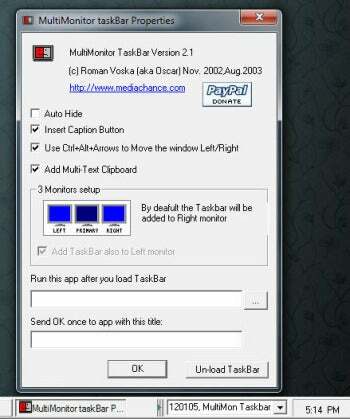 MultiMon Taskbar Free is an application that places a simple, basic taskbar on your secondary monitor, or even on two secondary monitors if you have a triple-monitor setup. MultiMon Taskbar Free feels old, but if your taskbar needs are very basic, it may suffice. The application is as bare-bones as they get. The MultiMon taskbar is horizontal and fixed to the bottom of the screen. It is "Windows default" gray, a color that is increasingly rare in today's Aero-drenched translucent interfaces. If you have fond memories of the taskbar used in Windows NT 4, that's pretty much what you'll see here. I have a dual-monitor setup, with the Windows 7 taskbar positioned vertically on the right side of the left monitor. That sounds complicated, but it means the taskbar is roughly in the middle. The left monitor also happens to be the secondary one, so when I launched MultiMon Taskbar Free, it just placed a second taskbar on the same monitor. There is no way to move MultiMon Taskbar Free itself, so I had to move my Windows taskbar to the other monitor. MultiMon Taskbar Free feels like a blast from the past, especially when compared with more modern alternatives such as DisplayFusion Pro. Admittedly, DisplayFusion Pro is a commercial product ($25), but it places a taskbar on your secondary monitor that looks and feels just like the native Windows 7 taskbar, right down to the glowing Start orb. I use Stickies for putting sticky notes and reminders on my monitor. Usually these don't appear on the Windows taskbar, but for some reason MultiMon Taskbar Free decided each sticky note was a window, and filled the taskbar with tiles that all said "ASticky." The only way to "fix" this was to exit Stickies (not much of a fix, really). Speaking of Stickies, its developer, Zhorn Software, also offers a free application for adding a taskbar to your secondary monitor. It is called ZBar and is similar to MultiMon Taskbar Free, but works much better. Like MultiMon Taskbar Free, its taskbar is horizontal only, but it contains presets for emulating the native Windows 7 taskbar and other classic taskbars. It has been updated much more recently than MultiMon Taskbar Free, and has a modest resource footprint. Sometimes free software is a wonderful thing, but sometimes it feels like you get what you pay for. I would recommend MultiMon Taskbar Free only for users who must go with a free solution--and have tried ZBar but didn't like it for some reason. Improve your PC's view with this free program to enhance multiple monitors.